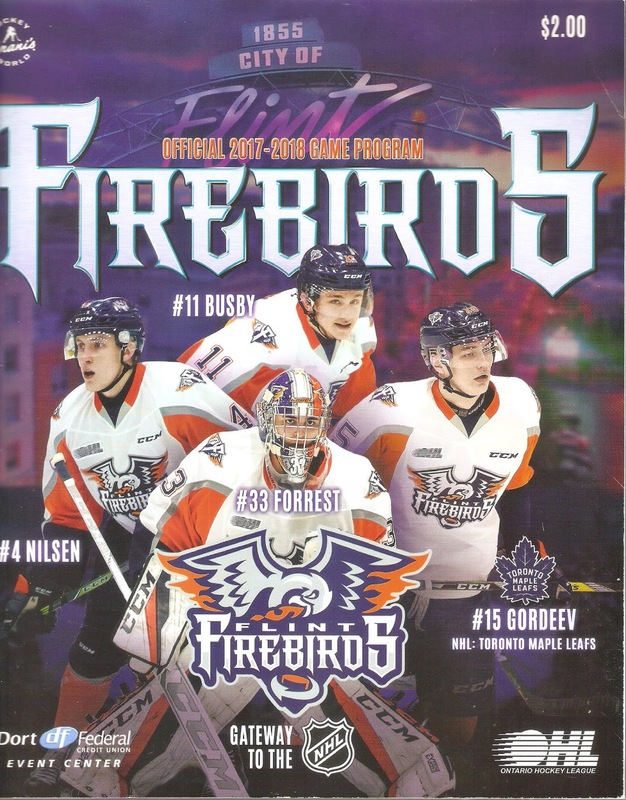 2017-18 is the third year of Flint Firebirds hockey in the Ontario Hockey League (OHL). The Firebirds are coming off a "bounce-back" season in 2016-17, in which they went 32-28-3-5 and made the playoffs after a disastrous inaugural season. Head Coach Ryan Oulahan returned behind the bench, but GM George Burnett was replaced by Barclay Branch (the son of OHL commissioner David Branch). 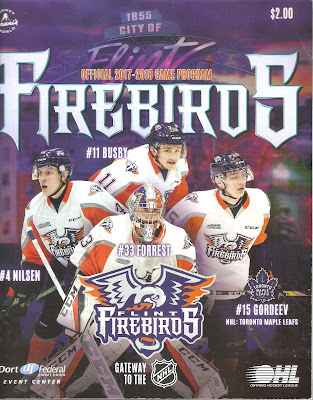 This program is from the game I went to between the Firebirds and Erie Otters. The Firebirds were in the middle of a long winless streak, and lost to Erie, 5-2. Probably one of the more uninspired OHL games I have ever went to. Rumors were flying that "suspended" owner Rolf Nilsen and his assistants were causing trouble behind the scenes again, leading to the players being disinterested on the ice. The Firebirds have had nice programs in each of their three seasons, and this is no different. It's 64 pages, all in color and on glossy paper. The front office and Coach Oulahan each have their own biographies. There is an article about billet families (the families that have OHL players live with them), and one about players that have been drafted by NHL teams. Local advertisements include Black Rock Bar & Grill, Perani's Hockey World, Sagelink Credit Union and Powers Catholic High School.